The B-L High School JROTC is currently selling engraved bricks that will be displayed at the Batesburg-Leesville Armed Forces Monument. The B-L High School JROTC is currently selling engraved bricks that will be displayed at the Batesburg-Leesville Armed Forces Monument. The Armed Forces Monument, which is located directly in front of the SC National Guard building on Armory Street, features a granite marker for each branch of the United States military. The engraved bricks are used to create the paved plaza in front of the granite markers. 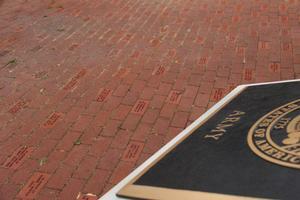 The bricks are a great way to memorialize a loved one or show your support for our country’s armed forces. Each brick measures 4” by 8” and costs $100. To purchase one, simply fill out a brick order form that can be found by visiting http://blhs.lex3.org/ and looking under the JROTC section of the Departments tab. Anyone with questions can contact the B-L High School JROTC at 803-532-9251. In addition, on Saturday, April 13th at 10 o’clock in the morning, the B-L High School JROTC will host a ceremony at the Armed Forces Monument to present and commemorate bricks that have recently been purchased in honor and memory of individuals and organizations within the community. The public is invited to attend.